The city of Arequipa (a.k.a La Ciudad Blanca, the White City), is at an altitude of over 2330m in the Andes mountains of southern Peru, with the majestic ex-volcano of El Misti towering above it. 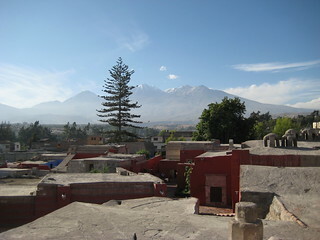 Arequipa’s population is about 1 million, making it the largest city in the Peruvian Andes. 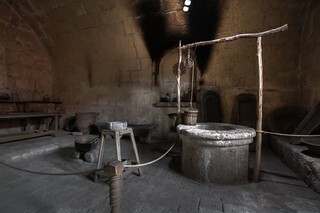 Arequipa’s colonial era Spanish buildings are made with the creamy volcanic rock known as sillar. The city historic centre’s well preserved architecture has earned it the status of a UNESCO World Heritage Site. 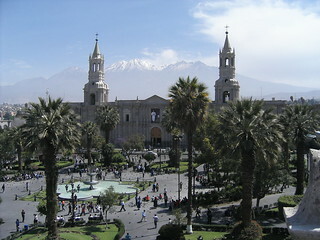 Throughout history Arequipa has played a large part in the emergence of the Republic of Peru. The Southern Railway links Arequipa with Lima, the capital of Peru, many other cities and the port of Matarani. 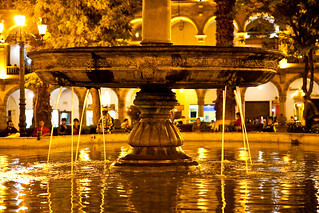 Arequipa’s warm/dry climate is due to the high elevation; sunny daytime weather with temperatures 20° to 25°C is followed by cool evenings with temperatures from 5° to 10°C. In and by the city, the Santa Catalina Monastery, the Jesuit Church, the Basilica Cathedral and the Goyeneche Palace and Hospital are wonderful places to visit. The religious history of Arequipa can be experienced at the Church of Santo Domingo, the Convent of la Recoleta and the San Francisco Temple. The various grand houses (casas) such as Casa del Moral, Tristán del Pozo, Arróspide and Maestre Bustamante give you a sense of the Arequipa’s rich heritage. There are about 80 volcanoes in the nearby Valley of the Volcanoes. Arequipa’s a great centre for visiting the nearby El Misti (currently inactive) volcano, as well as the two smaller Chachani and Picchu Picchu volcanoes. The vast archaeological pre Inca and Inca period Lake Titicaca Aymaras region is also within easy reach.